Ever wish you could press the pause button on the ecommerce industry? It’s not easy staying current on the latest news, trends, and insights. Plus, not all information sources are created equal. 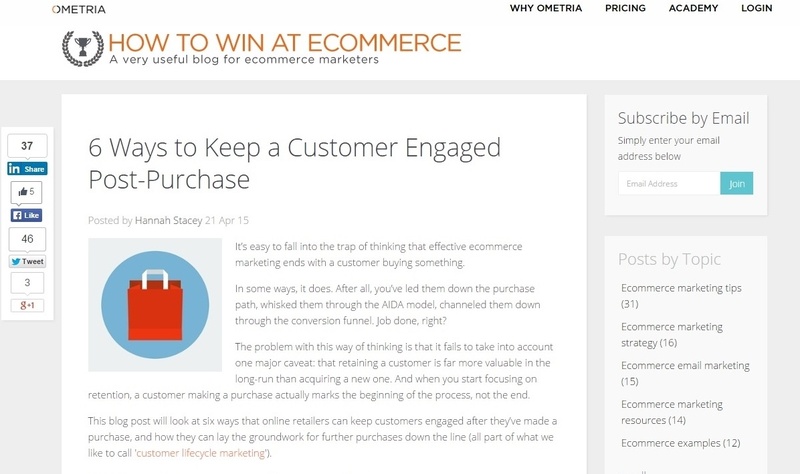 So we hand-selected 16 of the best ecommerce blogs and featured them in this post. You should check them out because they will help you become a better online seller. Richard Lazazzera is an ecommerce entrepreneur and founder of A Better Lemonade Stand. He shares his real-life experiences of building an ecommerce business from scratch and does a great job of taking readers along on his journey. His focus is helping early stage entrepreneurs build, launch, and grow their own businesses as well as partnering with the most influential companies and people in ecommerce to assist in shaping the direction of ecommerce for the future. 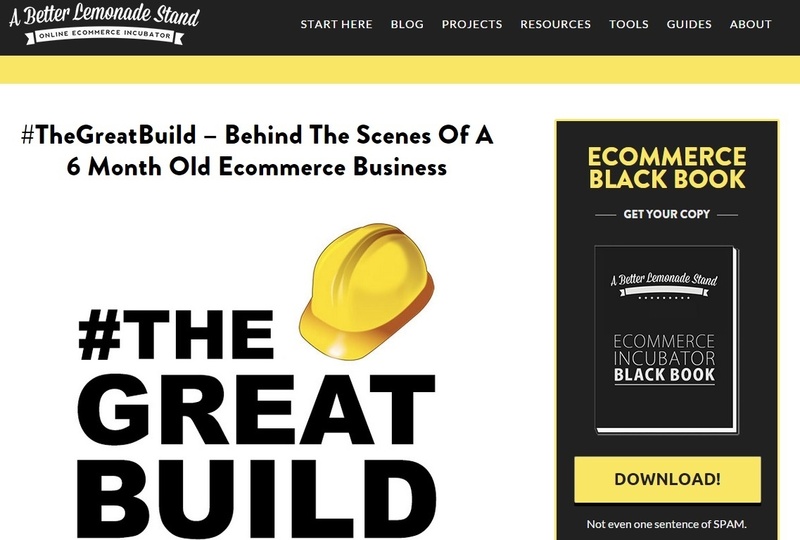 One of his top posts comes from his series #TheGreatBuild where he takes the reader Behind The Scenes Of A 6 Month Old Ecommerce Business. Lazazzera shares the biggest challenges he faced and how he overcame each one of them. Shabbir Nooruddin is a successful ecommerce entrepreneur who grew up in New York City. He draws from his years of experience and provides his readers with practical advice and various perspectives on a number of ecommerce topics. 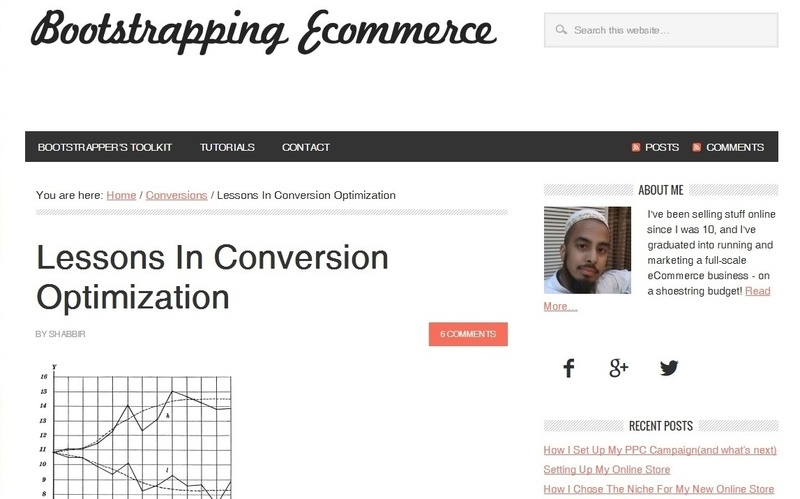 In one of his top posts, Shabbir gives his audience some Lessons In Conversion Optimization. He describes how the conversion rates for his online store were dismally low, and how, after trying almost everything to improve them, he was finally able to break through and solve the problem. Drew Sanocki is a New York-based online retail veteran. He bootstrapped his own retailer in 2003, grew it into a national brand, and sold it in 2012. Now he advises ecommerce executives on achieving growth. “My approach is not what you’ll find on the thousands of other online marketing blogs. I focus on ecom. And I get tactical about what worked at my retailer, and at those I work with,” says Sanocki. 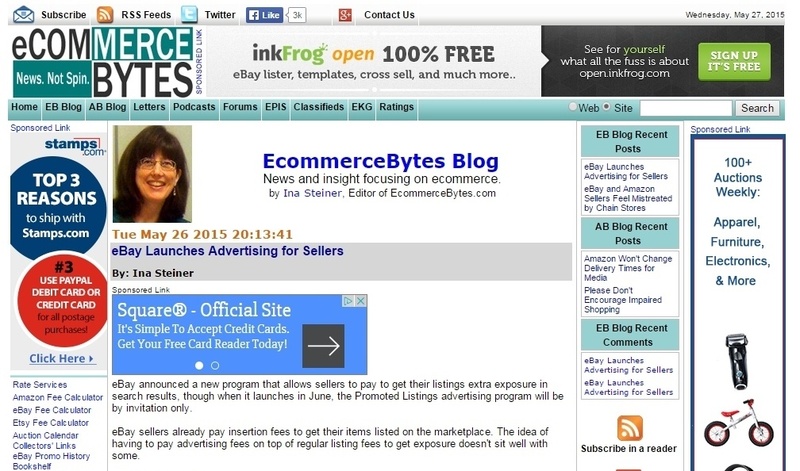 Ina Steiner is a co-founder and editor of EcommerceBytes – the leading publisher and number one source of news for ecommerce and online merchants. She and her husband David are frequently quoted by major news organizaitons about eBay, online trading, and internet fraud including such publications as Wall Street Journal, New York Times, Smart Money Magazine, and Fortune Small Business. “Ina is a true e-commerce authority that has led countless sellers, buyers, and businesses through the online shopping evolution. Her reporting is concise, insightful, and lightning fast,” says software engineer Michelle Mei Ling Waldorf. EcommerceBytes has a loyal follower base that actively participates with each post. 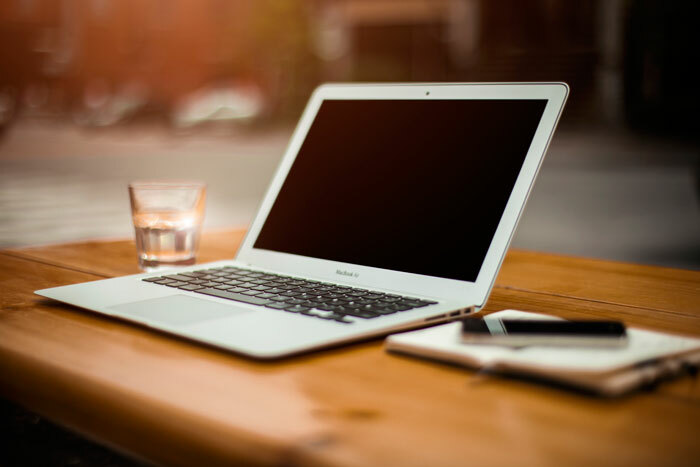 If you want to get the latest ecommerce news and find out what other online sellers have to say about it, then look no further than her blog. Andrew Youderian is the founder of eCommerce Fuel – one of the web’s best communities and knowledge centers for independent ecommerce merchants. Youderian has a fascinating story of how he became involved in the ecommerce industry. He quit his investment banking job to start his own ecommerce businesses, which collectively generated $1 million in revenue in 2011. “Four years and numerous businesses later, I’ve decided to start sharing my knowledge on this blog. My hope is to help others who, like me in my banking days, want to build a better life for themselves through entrepreneurship,” says Youderian. 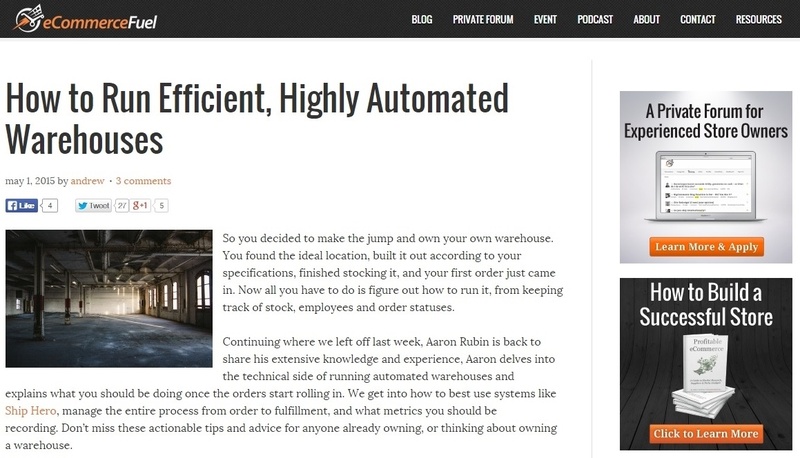 In one of his top posts, Andrew reveals How to Run Efficient, Highly Automated Warehouses. He addresses topics such as what to look for in warehouse employees and how to correctly manage the process from receiving orders to shipping them out. Check out the podcast linked in his post to get the full scoop. John Larkin runs eCommerceLift – a blog about ecommerce growth. He has built software for the ecommerce industry in the past and currently is involved in his own hardware tech startup. Larkin gives his two cents on topics such as Facebook advertising, conversion rate optimization, email marketing, mobile ecommerce, and even customer service. In one of his top posts, Larkin shares 6 Tips That Will Maximize Your Store’s Mobile Impact Right Now. 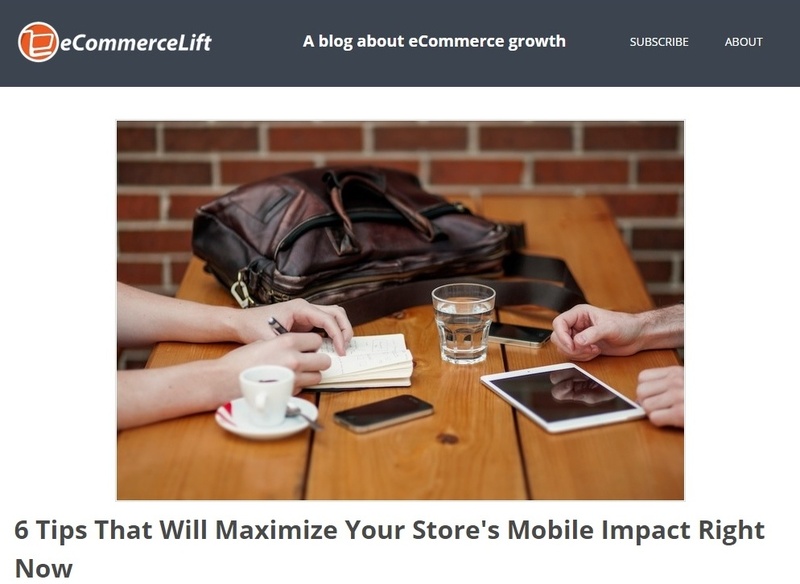 He explains why mobile for ecommerce has become so important, as well as what merchants can do right now to make their store more mobile friendly. Catalin Zorzini is the founder of Ecommerce Platforms – an unbiased review site that shows the good, great, bad, and ugly of online store building software. “In 2013, I wanted to help a friend find the best ecommerce solution for his future online shop. After realizing there are so many different options, more than someone could compare in a couple of days, I decided to make it easier for others and started this blog,” says Catalin. If you’re more of a fan of the technological side of ecommerce, this is the blog for you. 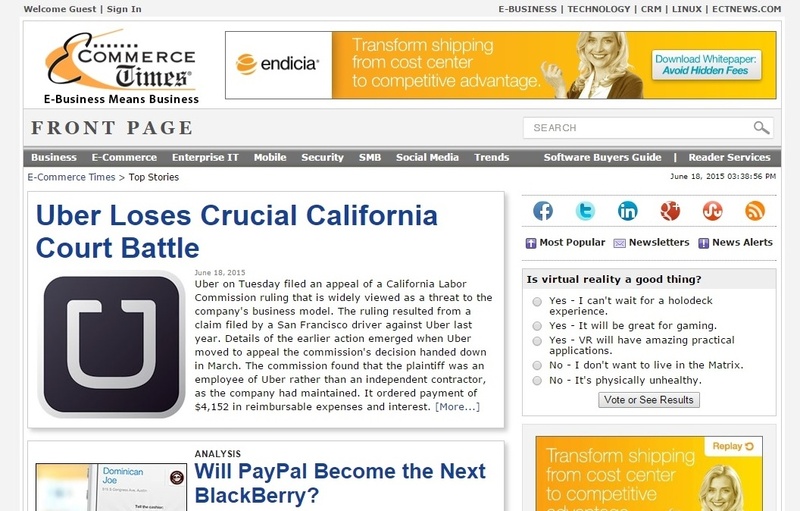 Ecommerce Times publishes fresh content daily about enterprise IT, mobile, security, social media, and much more. They also cover the latest trends and innovations that are driving ecommerce growth around the world. This includes hot topics of discussion and the opinions/advice of accredited experts. So if you want to stay informed and ahead of changes in the ecommerce industry stay tuned to Ecommerce Times. Get Elastic covers all aspects of ecommerce. 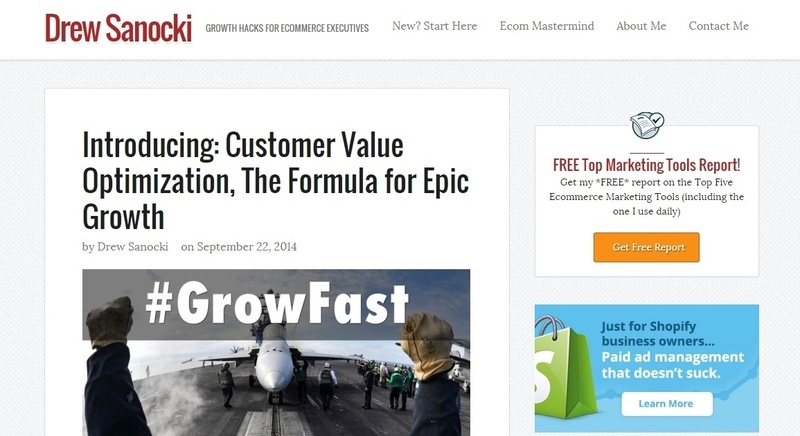 It is the place to go for ecommerce tips, tricks, news, and commentary. Their award-winning blog was recently named the #1 ecommerce blog by PostRank and one of the 15 entrepreneur blogs worth reading by the Wall Street Journal. 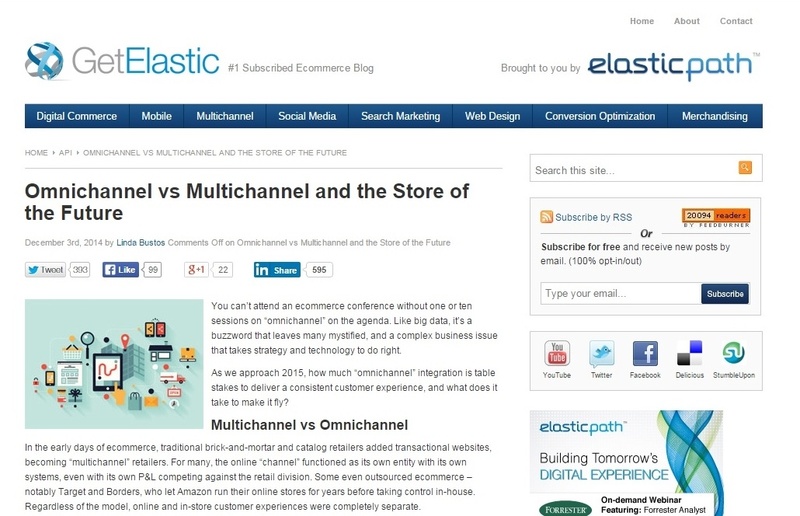 In one of their most shared posts, Linda Bustos compares multichannel to omnichannel sytems in Omnichannel vs Multichannel and the Store of the Future. Even though these terms are often used interchangably, Linda explains why these terms in fact mean two different things and how retailers can stay ahead of the curve with omnichannel integration. Hannah Stacey is the manager of How to Win at Ecommerce – a very useful blog for ecommerce marketers. “It is the best place for actionable advice on becoming an ecommerce champion (in my humble opinion anyway! )” says Stacey. In one of her top posts, Hannah looks at 6 ways online retailers can keep customers engaged after they’ve made a purchase, and how they can lay the groundwork for further purchases down the line. The mission of Practical Ecommerce is simple: to provide down-to-earth articles and commentary to help ecommerce merchants succeed. While it is a simple strategy, few are better at providing useful content to their readers. Practical Ecommerce covers a wide range of topics from marketing advice to effective social media tactics to SEO. They also have a small army of authors who contribute to their site on a regular basis. 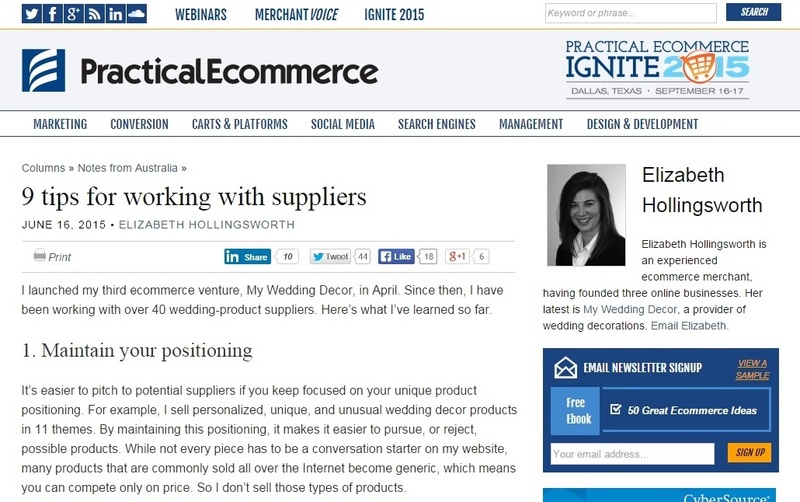 In one of their latest posts, Elizabeth Hollingsworth, an experienced online retailer herself, provides 9 tips for working with suppliers. Elizabeth offers advice for how to communicate with your suppliers as well as how to cut costs throughout the entire order process. This list just wouldn’t be complete without mentioning Shopify. Not only do they dish out high quality, actionable content to their target audience, but they also do so multiple times per week. From resources and tips for getting started, to things you can do to generate more traffic and sales today, to ideas and examples for improving your business, Shopify has all the bases covered. 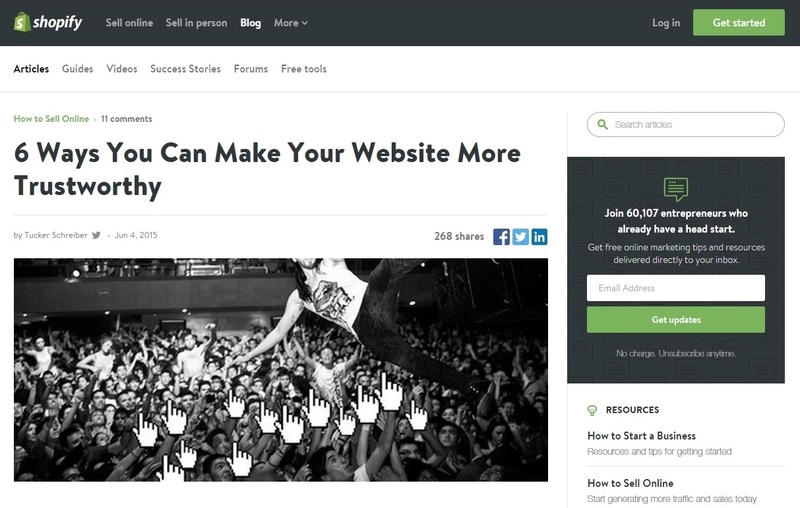 In one of their top posts, Tucker Schreiber reveals 6 Ways You Can Make Your Website More Trustworthy. Schreiber covers the importance of having a trustworthy website, and things you can do immediately to instill a sense of trust in your business. Skip McGrath is one of the most well-known names in the ecommerce industry. From his successful pubished books, to his impressive sales numbers on eBay and Amazon, he has truly become a remarkable success story. Skip’s most notable published book is The eBay Power Sellers Manual. 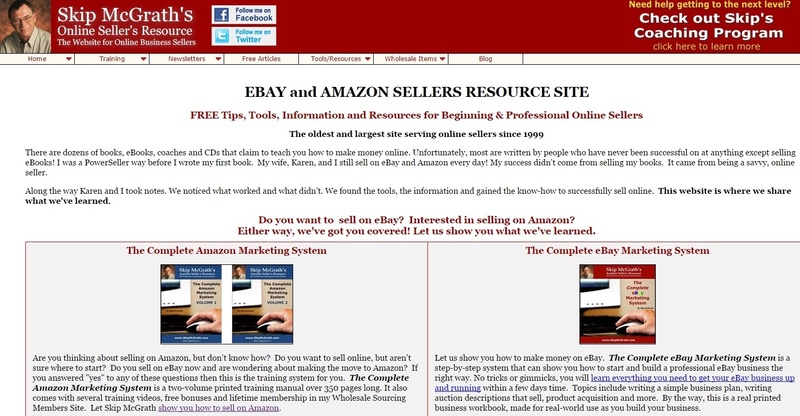 For beginners, he offers The Basic Guide to Selling on eBay, which has also been a big success. Today, over 25,000 eBay merchants own Skip’s manuals, including many of the top sellers! McGrath’s site is packed with testimonials from satisfied merchants who have used his books to boost their sales. Stay tuned to his blog if you want to get his take on the latest ecommerce developments and trends. Hillary DePiano has been involved with ecommerce ever since she started her first business in the mid-90s. Now she shares her strategies for selling success on topics like self-publishing, social media, marketing, productivity, and other life hacks. Hillary also sells books that help merchants become more profitable on eBay and Amazon. Because she has two decades of experience under her belt, you know that the tactics she teaches have been tested and proven. In one of her top posts, Hillary reveals how to Increase the number and variety of products you have for sale to make promotion easier. 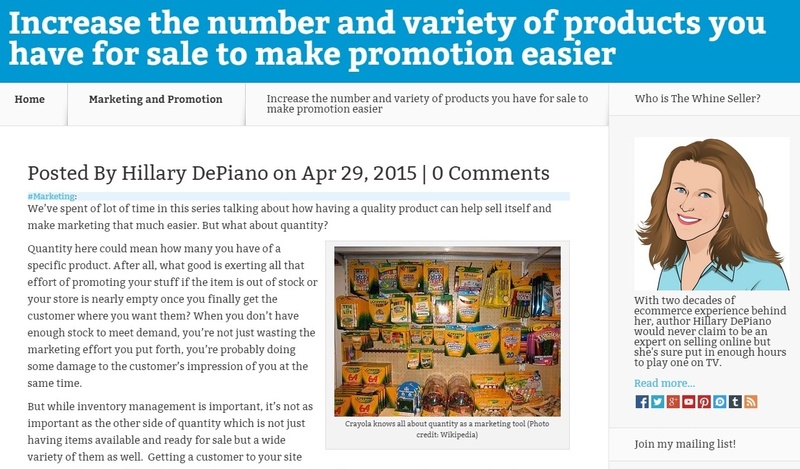 She explains why listing multiple products will increase your chances of making a sale as well as how to effectively cross-promote your products. Tim Peter is an award-winning B2C and B2B ecommerce executive and digital marketing expert with over 18 years of success driving online revenues and profits. 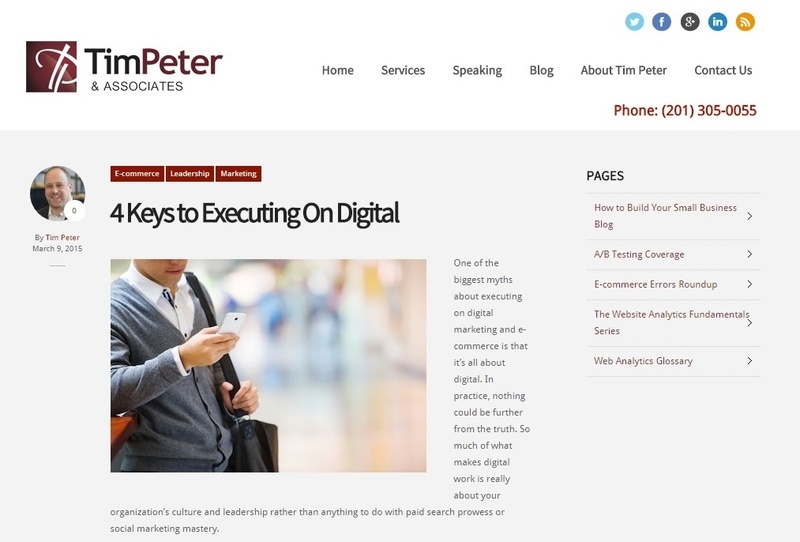 His writings have appeared in trade publications and multiple online sources, and his ecommerce and internet marketing blog – Tim Peter Thinks – attracts a large following each month. Andy Geldman is the founder of Web Retailer – a free community site for businesses who sell through online marketplaces such as eBay and Amazon, with over 10,000 members worldwide. Web Retailer’s unique Data and Statistics series of blog posts has covered topics including the world’s biggest sellers on eBay and Amazon. The World’s Top eBay Sellers alone has been read more than 60,000 times. I’m sure there are other ecommerce blogs that we didn’t mention. What ones would you recommend? We’d love to check them out, so let us know in a comment below. Etail Solutions is a premier provider of integrated sales, fulfillment, and supply chain automation solutions for online multi-channel retailers. Our Etail Vantage Platform (EVP) solves the real-world problems of mid-high volume online merchants by enabling coordinated multi-channel commerce through dynamic integrations to sales channels, suppliers, product catalogs, shipping solutions, ERP systems, and marketing channels. Yes, of course, every blog is valuable for us! Thanks for bringing this matter to our attention! I value your opinion! Right here is the perfect webpage for anybody who wishes to understand this topic. You know a whole lot its almost hard to argue with you (not that I personally will need to…HaHa). You definitely put a new spin on a topic that’s been written about for years. Great stuff, just wonderful. It is interesting by what parameters you determined the best in this category, since I disagree with some positions on your list. If you indicated the source of the information, it would help you confirm that you obtained the data legally with the consent of the copyright holder. These blogs are very interesting and useful and you should definitely follow your advice and read many of this list. Such blogs can be very useful and it’s good that you put all of them into one article and could share this information with us for our education. I’m going to revisit once again since i have saved as a favorite it. really neatly written article. I will make sure to bookmark it and return to read more of your useful information. Thanks for the post.